What The F**k Is Dana White Fighting For? He’s taken mixed martial arts, a sport that was essentially moribund seven years ago — the bare-knuckle, anything-goes, kick-’em-in-the-kernels fights were outlawed in 36 states — and turned it into a moneymaking, crowd-frazzling sensation, a new heavyweight pay-per-view box-office champ. He accomplished this by using various business-savvy stratagems and dodges, but in a sense the inside mechanics are beside the point. How he did it really is by the force of his own multifaceted personality. At 38, he is profane, charming, ambitious, cunning, controlling, a whole lot of fun to hang around with, open like a book, closed like a fist. In fighters and fans, he inspires loyalty and fear, admiration and disgust. He has a shaved head. He wears skintight T-shirts. He looks badass, he talks badass, he is badass. In all respects, he has been the exact right guy to bring the UFC back from the dead. Consumers paid $2.25 billion for such games last year, and the demand for titles like “Diner Dash” is growing 20% year-over-year, according to the Casual Gaming Association. And while casual games appeal to everyone from pre-teens to old men (the world’s richest man, Warren Buffet, 77, haunts online bridge parlors while using the handle “T-bone”), women over 35 are the most likely to pay for them; 75% percent of those who pay for casual games are women, and 72% are over 35 years old. The result: The gaming industry is hustling to remake itself to please these paying customers. There have been blog entries about game prototypes, excerpts from the books, interviews with developers and sample adventures. Fans have devoured every morsel. ENWorld.org, a Web site that has covered everything about the release since it was announced August last year, is logging 10 million visits a month. And fans have been taking notes. Careful notes. Andrew White, a 31-year-old in Calgary, Canada, compiled every rule and statistic mentioned in those tidbits and published his own “4th Edition Pre-Release Rules Compilation” reference. White’s project turned into a massive engineering feat itself, going through 12 revisions involving 40 people, and consuming at least 150 hours of White’s life. He released an 86-page final version on Thursday. In his spare time, White is working on a doctoral degree in archeology. Even worse for Hasbro, just before midnight Wednesday, scans of the books appeared online, too. They weren’t homebrewed rip-offs like the Chinese editions of Harry Potter — the muttering online is that they were stolen copies of the electronic printing proofs, grabbed when the manuscripts were sent to the printer in March. The clue: Some of the contraband pages have prepress design symbols and a notation that dates the files to 10 days before Wizards announced they had sent the final product off to the printer. Wizards spokesperson Tolena Thorburn confirmed that the leaked online editions are real. “We are fairly confident that we’ve identified where the leak occurred, and are moving forward on handling it appropriately.” The fairly specific nature of the material no doubt left a clear trail to this particular rogue. Despite the free copies circulating, fans are buzzing on the Web about their plans to buy the books anyway. The purloined copies have even won a few new customers for Wizards: some bloggers who feigned disinterest in the fourth edition now say that the illegal copies have convinced them to buy the new version. And then there are the slipups. Buy.com shipped out a chunk of the books pre-release. No more than 100 (less than 10% of Buy.com’s total preorders for the books) shipped before the error was caught. But the lucky fans who got their copies early have been boasting about their treasure. Buy.com’s vice president of marketing, Jeff Wisot, says his team is investigating whether there was a miscommunication over the publishing date. “The parties involved have been dealt with and there are consequences for breaking the street date,” wrote Scott Rouse, senior brand manager for Dungeons & Dragons, in an online forum. Can we assume its claws go snikt! when deployed? * In France during the Nazi occupation, members of the Resistance violated the rules of warfare. They knew they could not hide behind them, and they were perfectly aware of the risks to which they were exposing themselves. Their glory is to have calmly faced those risks with full knowledge of the consequences. Like a battery, a fuel cell has three principal parts: two electrodes (a cathode and anode) separated by an electrolyte. Chemical reactions at the electrodes produce an electronic current that can be made to flow through an appliance connected to the battery or fuel cell. The principal difference between the two? Fuel cells get their energy from an external source of hydrogen fuel, while conventional batteries draw from a finite source in a contained system. The MIT team focused on direct methanol fuel cells (DMFCs), in which the methanol is directly used as the fuel and reforming of alcohol down to hydrogen is not required. Such a fuel cell is attractive because the only waste products are water and carbon dioxide (the latter produced in small quantities). Also, because methanol is a liquid, it is easier to store and transport than hydrogen gas, and is safer (it won’t explode). Methanol also has a high energy density–a little goes a long way, making it especially interesting for portable devices. The DMFCs currently on the market, however, have limitations. For example, the material currently used for the electrolyte sandwiched between the electrodes is expensive. Even more important: that material, known as Nafion, is permeable to methanol, allowing some of the fuel to seep across the center of the fuel cell. Among other disadvantages, this wastes fuel–and lowers the efficiency of the cell–because the fuel isn’t available for the reactions that generate electricity. Using a relatively new technique known as layer-by-layer assembly, the MIT researchers created an alternative to Nafion. “We were able to tune the structure of [our] film a few nanometers at a time,” Hammond said, getting around some of the problems associated with other approaches. The result is a thin film that is two orders of magnitude less permeable to methanol but compares favorably to Nafion in proton conductivity. To test their creation, the engineers coated a Nafion membrane with the new film and incorporated the whole into a direct methanol fuel cell. The result was an increase in power output of more than 50 percent. Google drew sneers when it paid $1.65 billion for YouTube in November 2006. Only 63 people worked at this little video distributor in San Bruno, Calif. It had minimal revenue but more clips, bigger buzz and a better user experience than Google. Sneer no more. YouTube is bigger than ever. The Google people are taking over the place, and they’ve found the buttons on the cash register — vindication for YouTube’s original crew, especially founders Chad Hurley and Steve Chen. Or, rather, partial vindication, since the original managers have been largely replaced by Google apparatchiks. The three-year-old YouTube site probably crossed a billion views per day worldwide a few months ago, exceeding even the lofty expectations by Google when it made the acquisition. (YouTube will only confirm it does hundreds of millions of views per day.) Thirty-eight percent of the video streamed on the Web now comes from YouTube, according to ComScore. No other player has more than 4%. Google owns the biggest television station on the planet. It will upload 600 years’ worth of video this year. “A studio declining to do business with YouTube would be like a cereal maker not dealing with Wal-Mart,” says Bobby Tulsiani, a JupiterResearch analyst. Google doesn’t share numbers, but it appears that YouTube will generate $200 million this year and maybe $350 million the next. It’s a mere 1% of Google’s sales, but up from a minuscule amount last year. In YouTube’s early days the main objective was to get eyeballs. Now it’s to get ads. Web video ad spending will climb from $775 million last year to $1.35 billion this year, estimates Emarketer. An ad on the YouTube home page, something Chad Hurley experimented with before Google bought YouTube, now costs $175,000 a day, plus a commitment to spend $50,000 more in ads on Google or YouTube. Pricing for display advertising next to user-generated content has collapsed. Rates on sites such as Facebook, MySpace and YouTube have fallen 45% since February, to 18 cents per thousand page views, according to digital analytics outfit PubMatic. Most of the momentum now, says Chris B. Allen, director of video innovation at media buyer Starcom, is for ads within full episodes run on the TV networks’ sites, such as NBC and Fox’s Hulu, ABC.com and CBS.com. It’s a format that advertisers understand. That’s why YouTube is pushing studios and networks for professionally produced content like movie trailers and TV clips. It also offers them branded channels, with customized backgrounds and well-selected video. Hundreds of channels are sold to advertisers such as Nestlé, Hanes, 3M, Procter & Gamble and Hewlett-Packard. These go for $200,000 apiece. Last December YouTube opened the program up to individuals, picking up a few thousand more places to run ads. MySpaceTV is building a similar branded arena where professionals can build channels with ads tucked in before, during or after their films roll. YouTube has done a lot of experimenting with ad formats and found some surprises. Pre-roll video ads prior to the main video cause the audience to click away up to 70% of the time. Better: short banners that pop up from the bottom of the video window. The NBA channel runs rollover Patrón tequila ads that turn into a video how-to for making margaritas. “It’s finally a way that advertisers can leverage the massive amount of video streams without the fear of being next to the soccer kid getting kicked in the nuts,” says Davis Brewer, lead strategist for emerging channels for media planning firm Spark Communications. People click on those rollover ads 8 times as often as on standard display ads next to the video. The rollover ads are most effective if they appear 15 seconds into the video. Any earlier and people get turned off. When the rollover is run in tandem with a display ad next to the video box, the chance of someone clicking can be 46 times as good. In March Google rolled out an analytic tool for users and advertisers called Insight that shows a video’s daily traffic and demographic stats inside an interactive window copied from Google’s stock quote pages. A dynamic map shows creators where their work is popular over time, so a movie studio planning a film opening can decide where to deploy its marketing budget. A rock band can plan its next tour route based on where the fans of its videos live. “They can’t believe the data we have,” says Hoffner. The world’s rarest rhinoceros has been captured on film by a specially installed camera in the jungles of Java, Indonesia. But the female rhino, which was accompanied by a calf, promptly charged the camera, sending it flying. The animals are at severe risk of extinction, with only 60-70 animals left in the wild. A spokesperson for WWF said the footage provided an unusual glimpse of the rare beasts in their natural habitat. Rachmat Hariyadi, who leads WWF-Indonesia’s project in Java’s Ujung Kulon National Park, said the motion-triggered camera “traps” were a useful way to observe the ways in which animals used their habitats, aiding conservation efforts. But Stephen Hogg, also from WWF, who designed the hidden cameras, said he was puzzled by the rhino’s attack. “The assault on the camera still has us baffled because we specifically use infrared lights as the source of illumination when we designed and built these units so as to not scare animals away when the camera activates,” he said. 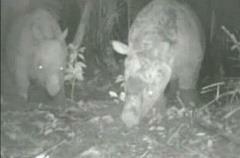 Javan rhinos are found only in two locations; Ujung Kulong National Park is home to 90% of the total population. Efforts are underway to create additional Javan rhino breeding groups by translocating a few individuals from Ujung Kulon to another suitable site. 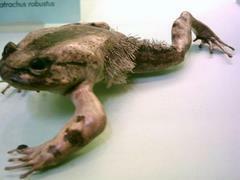 This could help prevent an extinction caused by disease or a natural disaster, conservationists say. 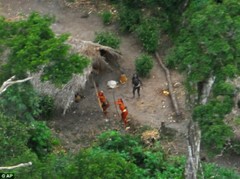 In this image made available Thursday May 29, 2008, from Survival International, showing ‘uncontacted Indians’ of the Envira, who have never before had any contact with the outside world, photographed during an overflight in May 2008, as they react to the overflight at their camp in the Terra Indigena Kampa e Isolados do Envira, Acre state, Brazil, close to the border with Peru. ‘We did the overflight to show their houses, to show they are there, to show they exist,’ said uncontacted tribes expert José Carlos dos Reis Meirelles Júnior. This is pretty obviously begging the question of why we want to conserve gasoline. If gasoline is a precious resource, and we only have so much to go around — in the short or long term — that is presumably reflected in a high price, and people make all kinds of trade-offs to use less gasoline: driving less in the short term and buying smaller cars or moving closer to work in the longer term. If gasoline prices are low, there’s little reason to make those trade-offs. This is a question of resource allocation, not moral rectitude, and making sacrifices in the short term is not always right. Now, while it makes little sense to tax gasoline because we might run out some day, it does make some sense to use a gasoline tax as a use tax for public roads, or as a crude tax on pollution. 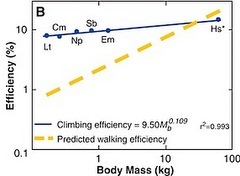 A fascinating brief study published in Science (May 16 2008) shows the cost of climbing a meter per unit of body mass is essentially the same over non-human primates and humans (Hs in the figure). The data are all matched for climbing speed. Walking efficiency is also indicated in yellow. We homo sapiens are pretty efficient climbers, though being the largest of the primates we may be a bit slower at it. On the other hand we are more efficient in walking. The reason for that is we have longer legs per unit of body mass. Methane hydrate is a crystalline solid that consists of methane surrounded by a cage of water molecules. It looks much like water ice. This strange substance, found in vast quantities in permafrost and on the ocean floor, has a fascinating history. Natural hydrates were first found in the 1930s when chlorine hydrate (a similar material with chlorine instead of methane) plugged natural gas pipelines. 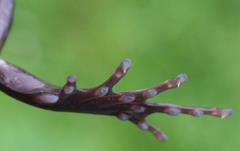 Most research focused on preventing their formation. In the 1960s, scientists discovered naturally occuring methane hydrate in Siberian gas reservoirs. Before this period, methane hydrate was thought of as an unusual and unnatural substance that only occured in chem labs and gas pipelines. No one suspected that it was common in nature, let alone in the vast amounts which we currently estimate. Stable at depths greater than 300m, it melts quickly when removed from its natural environment. Because of this, it was not actually seen until 1974, when Soviet scientists successfully recovered nodules from the floor of the Black Sea. Methane is the byproduct of bacterial breakdown of organic matter (ie “rotting”), which also creates hydrogen sulfide, which our noses recognize as sewer gas. Since organic material constantly falls to the ocean floor, in retrospect it makes sense that bacteria there digest it. On land, methane escapes into the atmosphere, but on the ocean floor, low temperatures and high pressures trap it into sewer ice. The oceans have been around for quite awhile, and the earth’s reserves of this previously unknown substance are staggering. Methane hydrates are conservatively estimated to contain twice as much carbon as all other known fossil fuels, and this discovery means that scientists need to re-think the global carbon cycle. It has naturally been considered as a possible fuel, and a number of governments are digesting this possibility. Fantastic though it sounds, frozen flatulence may fuel the future! More seriously, this discovery poses some serious worries on the global warming front. Methane is ten times more effective a greenhouse gas than carbon dioxide, and so much of it is trapped in hydrates that it could have a major effect on our climate. This might happen through a dangerous feedback loop. First, some other effect causes a slight warming of the earth, including its oceans. This melts some methane hydrate, releasing methane into the atmosphere. This adds to the greenhouse effect, making temperatures go up more, and the cycle repeats. In fact, Dr. Euan Nisbet of the University of Saskatchewan thinks this effect may have been behind the rapid climate change which followed the last glaciation. There is a lot of energy stored in the form of hydrates. One sign of a city’s potential as a technology center is the number of restaurants that still require jackets for men. According to Zagat’s there are none in San Francisco, LA, Boston, or Seattle, 3 in DC, 7 in London, 11 in New York, and 20 in Paris. Before 1786, authors invariably presented quantitative data as tables of numbers. In this year, an economist named William Playfair published a book called The Commercial and Political Atlas . Remarkable recent efforts have brought this classic back into print, as Playfair’s Commercial and Political Atlas and Statistical Breviary (2005). In order to illustrate his economic arguments, Playfair single-handedly invented the line graph, the bar graph, and the pie chart, and thereby the entire field of statistical graphics. Within years, his inventions had spread across Europe, transforming the landscape of visual communications and heralding an age of discoveries in data made visible. Today, children take these graphical forms for granted; they seem as obvious and fundamental as written language. There is quite a bit to the article.